Importing and exporting seems to you like an easy business to get into. You can handle logistics. It’s just moving containers around on boats, right? And if someone asks you a hard question you don’t know how to answer, there’s enough of a mystique around the work that you can make something up and no one will be the wiser. But, as in most things in life, the actual business is harder than you thought. You have to have the right items in the right places, and you have to use the momentum of your competitors wisely to complete your own goals. And the success of your business might involve moving contraband, but you didn’t hear that from me. Build your own importing and exporting empire so you can retire on a tropical island. The open sea is calling! 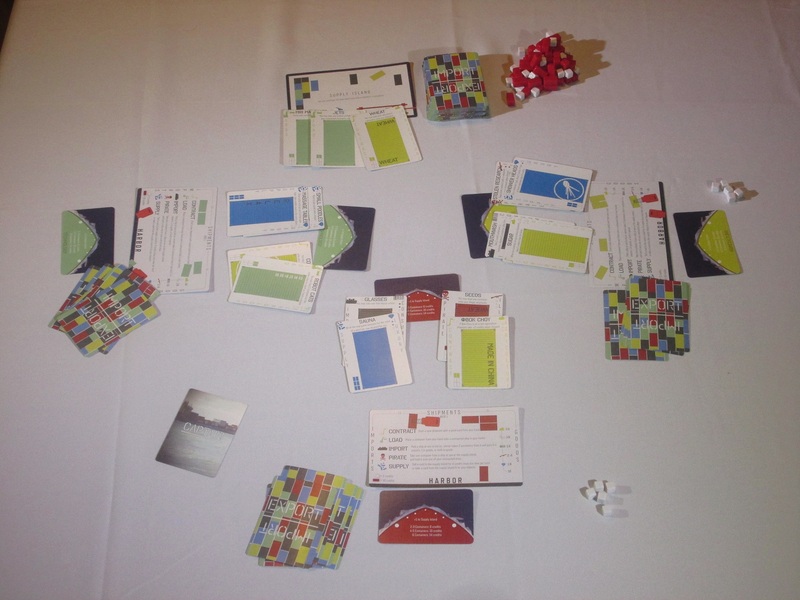 Import/Export is a role-selection, hand management, tableau-building, multi-use card game for two to six players. Players are shipping magnates who are seeking to control the import/export market. The player with the most credits when the game ends wins. Import/Export set up for three players. Yes, the table looks cluttered, but you get used to it in play. To begin, each player receives a harbor, two matching-color boats, and a hand of five cards. One of the boats begins in the middle of the table (at sea); the other remains at that player’s harbor. Each boat receives four starting containers. The supply island and draw deck are placed within reach. One card per player is added to the supply island to begin. 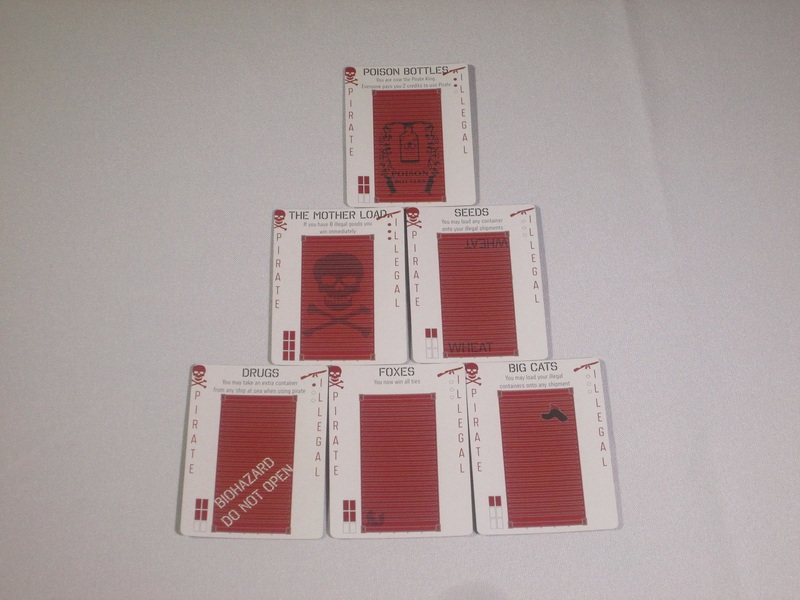 Each card in the game has multiple uses and can be either a role (if played when leading or following), a contract (if played to a boat using the contract action), a container (if loaded onto a ship to fulfill a contract), an import (if placed in imports using the supply or import action), or a good (if placed in goods using the import action). On a turn, players may either draw or lead. If players draw, they refill their hand up to five or draw a single card. If a player leads, the player plays a card from their hand (or two matching cards as any action). Each other player may either follow (play a matching card) or draw (refilling their hand or drawing a card). Then, beginning with the player whose turn it is and going clockwise, each player may take actions, one action for leading or following the turn’s role plus one additional action for each matching import. The actions that can be taken are contract (start a new shipment on a boat with a card from hand), load (put a card on the boat to fulfill that shipment), pirate (take a container from a ship at sea and load it onto your boat in harbor), supply (sell a card to the supply island or take a card from the supply island as an import), and import (hold an auction for containers at sea, which become either imports or goods). A player harbor. 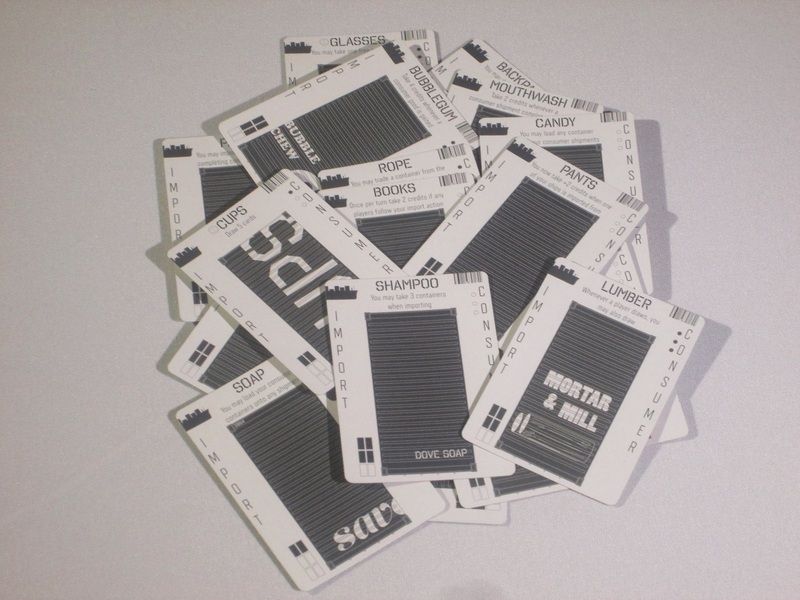 Players tuck cards during the game, which can be shipments, imports, or goods. The harbor also provides a useful reminder of the actions you can take. The game ends at the end of a turn whenever one player has fifty or more credits. 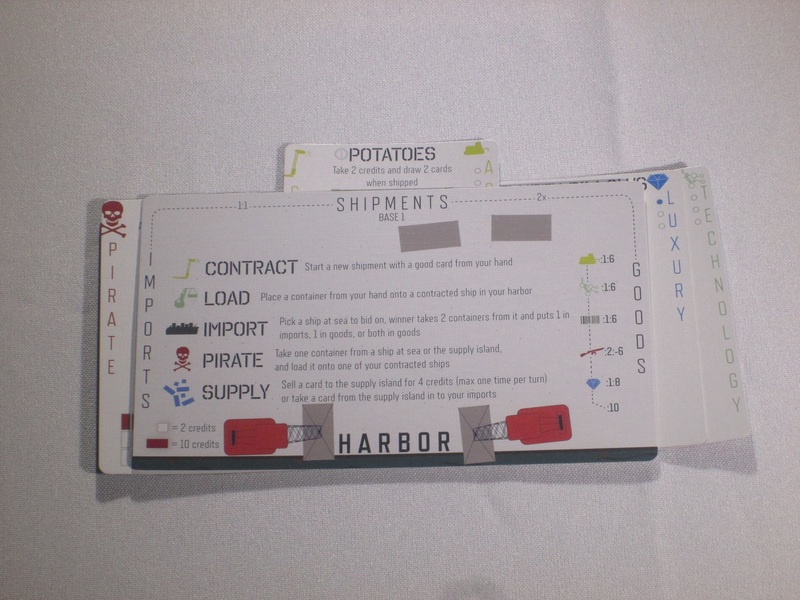 Players score credits for individual goods in their harbor as well as for having the most of each kind of good and a bonus for having one of each type. The player with the most credits wins. When a game flaunts its connection to Glory to Rome, it can be a benefit or a detriment. Glory to Rome is my favorite game, and if a game borrows liberally from it, it had better make good use of the raw materials. I hated Mottainai perhaps more than it deserved because of its claim to be a spiritual successor to Glory to Rome. But for Import/Export, this connection is a benefit. In fact, Import/Export is the first game I would recommend to people who want the hopelessly out-of-print Glory to Rome but are unable to get it. And this is high praise indeed. A shipment for the green player. 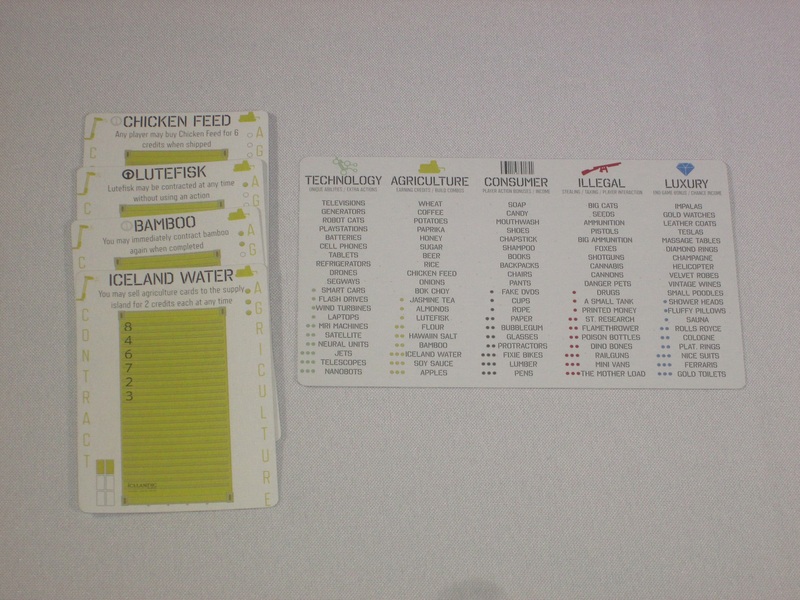 The tucked card indicates the power the player will get once it ships, and players have to load a specified number of containers to complete it. Import/Export shamelessly borrows its core from Glory to Rome. Each turn involves one player choosing the action with each other player either participating in the action or drawing cards. 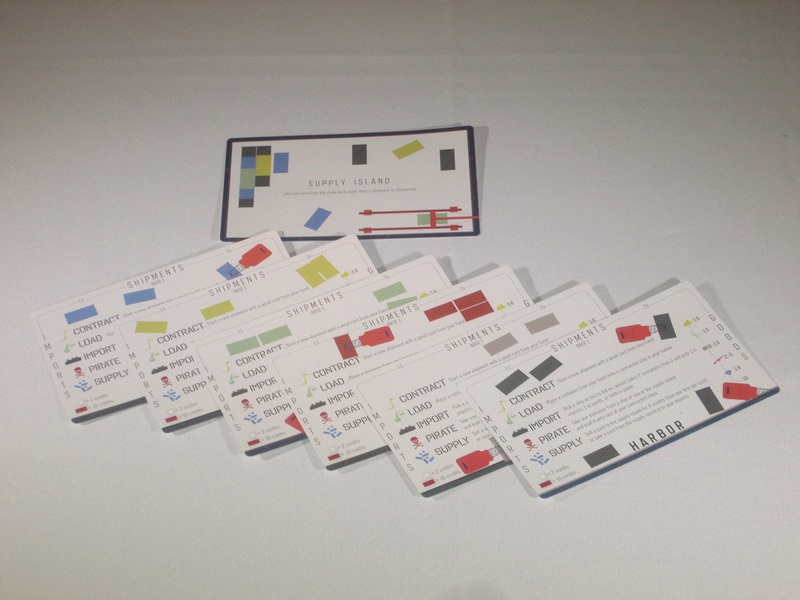 Each card can act as a role or import (client), a shipment (foundation), a container, or a good (material). 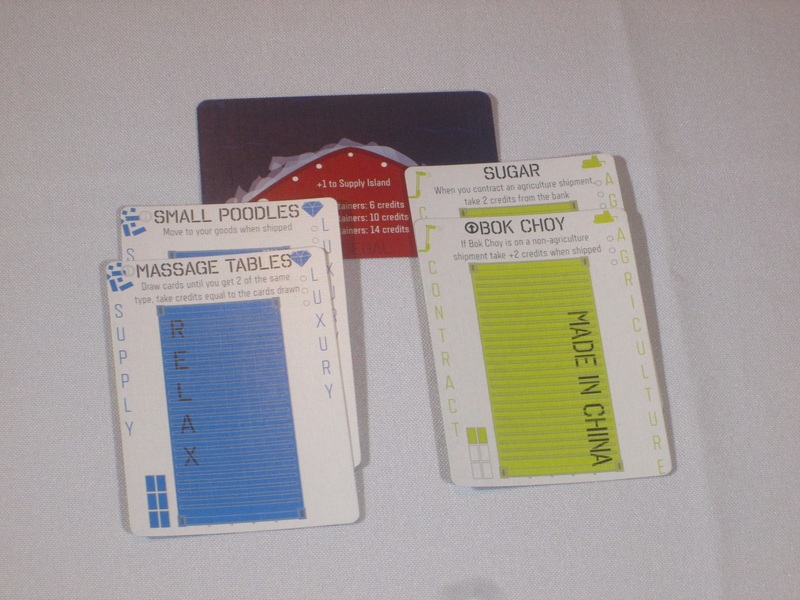 There are five different roles, each of which moves cards around the table in some way. The connection seems blatant at first, yet it is its own game, with its own distinct card flow and wrinkles and combos. I think it’s a hit. There is a tech tree in Import/Export. You can’t contract the better shipments until you have goods of that type (or extra contract actions). The obvious thing people will point to as a difference from Glory to Rome is the fully unique card powers from one contract to the next. One hundred or so unique powers, plus others available in the expansions, seems flashy and attractive, and it is kind of cool to see this. However, I prefer the smaller card pool in Glory to Rome (I find it less swingy), and besides that, I would argue the bigger departure from Glory to Rome is how cards are added to your tableau. In Glory to Rome, players lay a foundation on a building site, add a fixed number of materials to it, and then get the benefit of the building (plus additional influence). There is no limit to the number of foundations you can start, and in some games, I’ve started buildings liberally if only to speed the end of the game. In Import/Export, you are limited to your two ships, and each ship can hold a maximum of six containers. “Building” costs aren’t fixed, meaning one contract could cost two containers or six to complete. 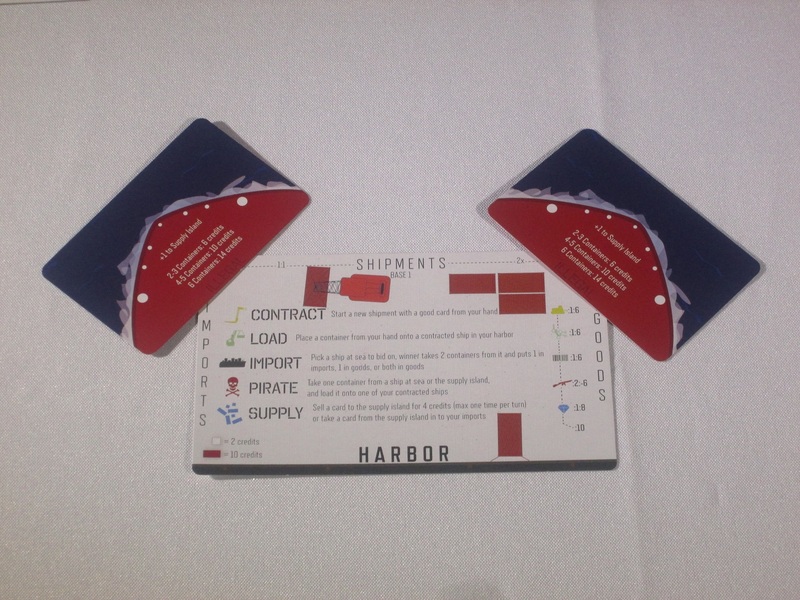 Then, once the shipment is complete, the contract card is added to your tableau, providing its power, but the containers on board the ship are then sent to sea, and you don’t get your ship back until those containers are either imported or pirated off your ship. 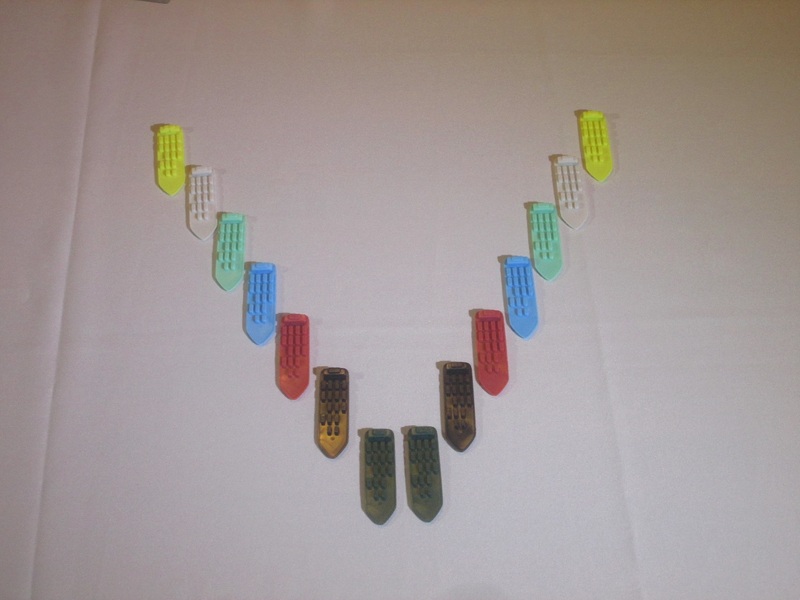 Each player receives a harbor and two boats in their color. The color also helps players with the tech tree in that color. This simple wrinkle in card flow leads to a whole different feeling when you play, and that alone is reason enough that I intend to keep both Glory to Rome and Import/Export in my collection. But in some ways, Import/Export is the tighter, meaner game, as it’s much easier to be excluded from actions because you’re simply unable to participate. Import/Export is also the meaner game in that most of the red “illegal” contracts provide punitive player interaction, forcing players to cough up cards or credits to the player who has them. Now, those who are used to Glory to Rome probably won’t find this interaction beyond the pale–anyone who has had their clients fed to the lions in the Colosseum or their buildings stolen through the Prison knows what it’s like to shake their fist at opponents–but for overly sensitive, build-my-own-garden Euro gamers, this is a warning: Import/Export can be nasty. Illegal goods. One of them lets you be the pirate king (whatever that means). But just because it is nasty doesn’t mean it isn’t fair (more or less). Import/Export is not a take-that game, and while one player’s power may seem nasty, you are likely to find another, equally nasty power on another red card. The shipments in each color in Import/Export follow a general pattern, so while every card’s power is unique, there are some similarities. You might not be able to do things exactly like another player, but you can probably find your own niche. Import/Export also has a rudimentary, albeit still interesting, tech tree. Powers in each color feel like they’re part of the same family of actions, and as such, it’s appropriate for these powers to be available across different tiers. Low-tier powers are weaker, but you can get them earlier in the game. As the game goes on and as you collect more goods (or you get more contract imports), you are then able to unlock more powerful abilities in the same family. Each player’s harbor is also color coded, and each player begins the game with one tier already unlocked, a small leg up on the other players. Importing is the heart of Import/Export. Spend your credits wisely! The heart of Import/Export is in its title: importing. Importing is the only way to get goods aside from card abilities, and goods serve the dual purpose of end-game points and satisfying technology tiers. Goods are a big deal. So it makes sense that getting them is a somewhat difficult process. The import action is by far the most difficult to understand concept in the game, namely because it introduces an action that is unlike the others in the game. While most of the actions in the game are simple card flow, importing involves an auction. Blind bidding speeds the process here because each player only gets one chance to bid, and this within a closed fist. However, as I can tell you from just about every other game that involves auctions, proper valuation is tricky. It’s hard to know just how valuable something is to you and to the other players, both subjectively and objectively. And with blind bidding, you can’t follow another player’s lead and bid up cards that should be bid up. 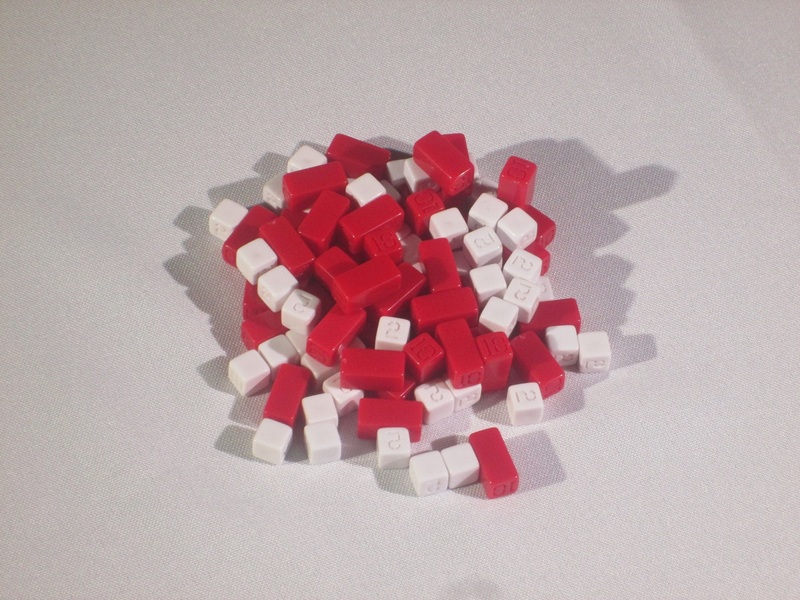 Credit cubes. These come in values of 2 and 10. The game ends when one player has 50. The game can last a while if players frequently import. Thus, importing–the heart of the game–is probably the most fragile feature of Import/Export. If players allow one player to run the import economy, it spells their own doom. However, the import action is also what will give the game legs because it is both what distinguishes the game from others and what makes the game interesting. Import/Export is not just a hand-management game; it is an economic game. Players have to constantly evaluate what imports are worth the risk and which aren’t. Players have limited space in their harbors, so they have to determine which imports and goods are best for them. In the games I’ve played, savvy importing has been the key to victory, and just as early games of Glory to Rome led to cries of the merchant action being overpowered, there have been “silver bullet” theories that an early import client is the key to victory. I haven’t played enough games of Import/Export to fully pronounce on this, but my strong suspicion is that this is a player problem rather than a game problem, and I fully expect that as players become more accustomed to determining the relative value of goods at sea, there will be more ways to keep import leaders in check. But allow this to be my warning: even though it is the hardest action to understand, do not neglect the titular action in your early games of Import/Export. The aspects of Glory to Rome that Import/Export borrows are still great in this game. The lead/follow role-selection mechanism allows all players to do something even when it isn’t their turn. The multi-use cards are a fascinating puzzle that, to me, never gets old. Managing your hand to get the outcomes you desire is a treat. As I said at the beginning of this review, Import/Export only benefits from what it borrows from Glory to Rome, and even in this borrowing manages to put it to different use, especially as there is an economic game layered on top of the familiar card flow. Containers at sea can be pirated or imported, but until they are, the player doesn’t get their ship back. Yet for all there is to love about Import/Export, it does have its rough edges. I’ve seen the designer describe this as a one-man effort, and it is an admirable one-man effort: this is a very good game. But there are some ways in which this solitary development shows. The rules, for example, are fairly ambiguous, and even after reading the rulebook four or five times, and after playing the game several times, we still usually have questions while playing, and these answers are hard to track down in the rulebook, if the questions are answered there at all. (It usually comes down to a ruling at the table and I check the Board Game Geek forums afterward.) The glossary of powers at the back of the rulebook–perhaps the most important part of the rulebook in a game with 100+ unique powers–does little more than restate the words on the cards with minimal clarification. (Compare this to, say, the Glory to Rome: Black Box glossary, from which I’ve never come away in any doubt on any question.) The problem with this is that the powers themselves are worded ambiguously and inconsistently, so it’s hard to imagine just what they should do. (We usually rule along thematic lines, which I think is right.) These things might be more annoying than they are if the game weren’t so good, but do be aware: this game takes work to learn, and it’s not as polished as it could be. The supply island is where cards can be sold or held for the supply action. This is one timer on the game: as players complete shipments, cards get moved here. Beyond the polish, the game is a punishing one. Because of the unique card flow–with players having to manage ships in harbor and at sea–players who play poorly may find themselves, even though they are technically able to participate in other players’ turns, without much to do. You can’t contract if you don’t have a ship with space; you can’t load if you don’t have a contract; you can’t meaningfully import if you haven’t completed shipments. It’s easy to imagine this spiral of despair because I’ve seen it. There’s a snowball effect in most engine-building games, but it’s more pronounced here because there are few ways out of your predicament. At least in Glory to Rome or Innovation, Carl Chudyk’s engine-building games of multi-use cards, there are technical victories you can achieve if conventional victory evades your grasp. While some of those are present in Import/Export, it’s much harder to achieve them if you are already under the wheel of capitalism at sea. And that’s the real “problem” with Import/Export. In a hobby that praises the cult of the new, where games are played once or twice and then moved on from, Import/Export feels out of place. It’s the kind of deep game that has a steep learning curve and gets better and deeper the more you play it. If you plan to play the game once or twice for kicks and then move on, I’d recommend not boarding the boat in the first place: you’re not going to get much out of this. Much like Glory to Rome, which I only teach to players who seem like they want to learn and who will play it more than a few times, Import/Export needs devoted players. No, this isn’t a “lifestyle” game like an LCG or CCG or miniatures game, but it’s not the kind of game that’s easily set aside and picked back up on a whim. It’s a bear to learn and a bear to teach, so you’re better off if you can make the most of the effort. Thankfully, the game is good enough that it’s the kind of game you want to play again and again, and the reason I put problem in quotes in the first place is this is exactly the kind of game that some players are looking for. The captain edition comes with fancy boats. FANCY. Several expansions are available for Import/Export. I was provided the Captain Edition for this review, which includes all of the Kickstarter expansions and plastic boats. I’ve read through the rules for these, and I will likely review them at a later date if the Import/Export base game ever runs out of gas. From my initial impression, I think there’s plenty of game in the base game, and although the expansions look like they add interesting twists (shipments that can use any color containers or the ability to contract directly from the supply island), they don’t seem necessary to me. (Of course, I never use the expansion cards in Glory to Rome or Innovation, either.) I even prefer the boat cards to the plastic boat miniatures. However, there’s a player in my group who loves to get every expansion to games he likes, and he insisted that we use the boats when we played. I’m definitely in the minority on the boats: most other players have preferred them. It’s nice that there’s more stuff for those who like it; I think there’s plenty to wrestle with and sink your teeth into with the base game. The components in Import/Export are mostly very good. The cards have linen finish, and the minimalist artwork, while not exciting, works, and there are subtle Easter eggs hidden in the container artwork. I love the package here, and I’m willing to forgive the nonstandard box size because it looks like one of the containers in the game. (It’s also still a pretty small box, especially for how “big” the game feels.) The plastic credit cubes are very nice–weighty and different–although having denominations for just 2 and 10 is an odd choice. 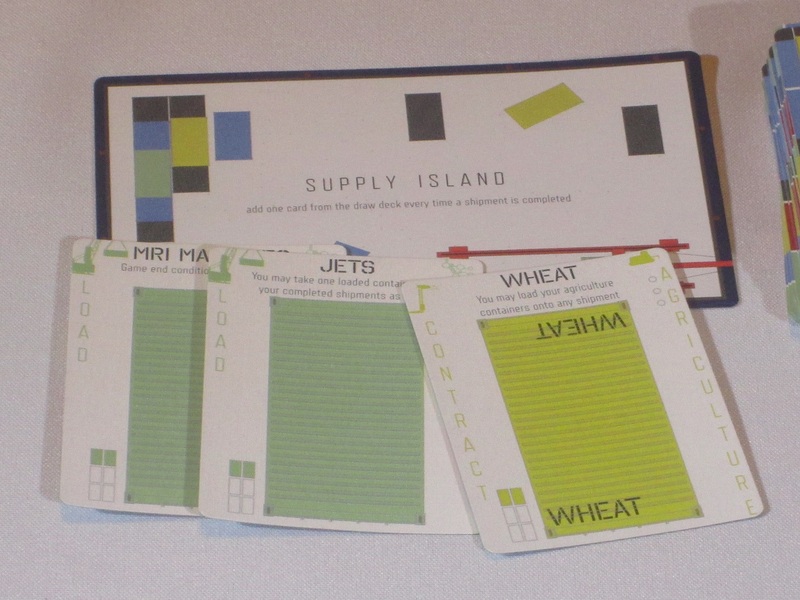 The player harbors and supply island are on the same linen cardstock as the cards and are oversized, and the harbors are probably my biggest gripe with the components. These seldom lie flat–they’re always warping or curling, I assume due to the moisture on players’ hands. A thicker cardstock would have been great here. 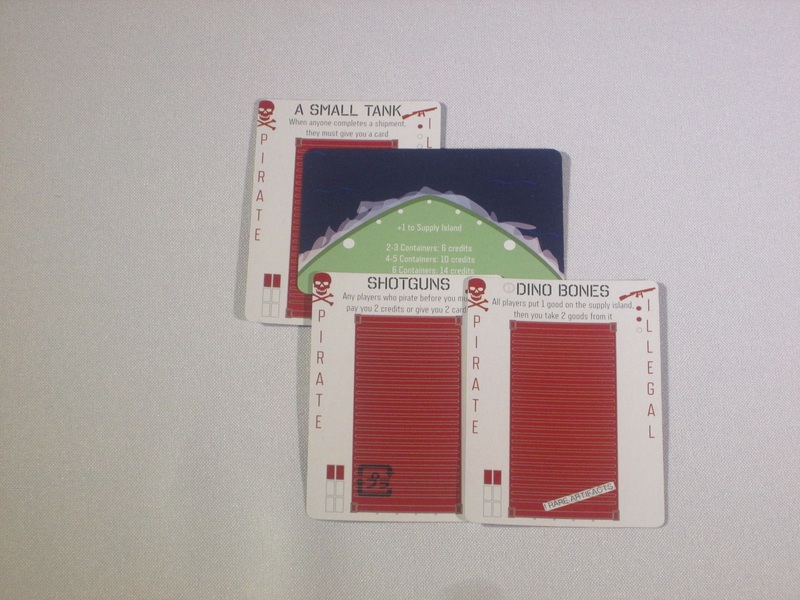 The harbors are also, unfortunately, a nonstandard size and are thus hard to sleeve. 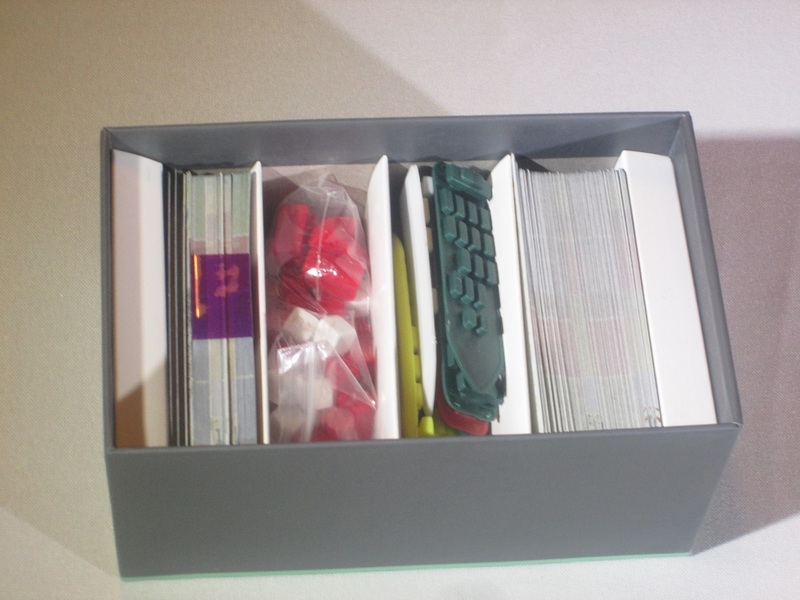 The insert holds all of Import/Export and its expansions in a small box. Wonderful. The game advertises play for two to six players; all of my plays have been in the three- to four-player range, so I can’t comment on larger or smaller games. I will say that Glory to Rome, in my opinion, is best with three and four, and in a four-player game, we were in danger of running out of cards (the closest we’ve come to that end-game condition). I do like that the game makes it possible for more players to join, but I will likely keep playing in the three- to four-player range. The game has consistently lasted just over an hour, which isn’t ideal for lunchtime gaming, but my coworkers haven’t minded making up a few minutes at the end of the day to play a meaty game like this over their lunch break. The harbor cards curl up a little and aren’t ideal, but they mostly get the job done. Import/Export is the first game to use Glory to Rome’s unique mechanisms in such a way that it provides a convincing argument to branch out from the earlier game. While its lineage is clear, Import/Export strikes off on its own and delivers a tight and fun game in a roughly one-hour time frame. It’s not a game for the faint of heart, and early games will likely drive players to forums and FAQs, but for those who press on, they will find a game that pays back their investment handsomely. 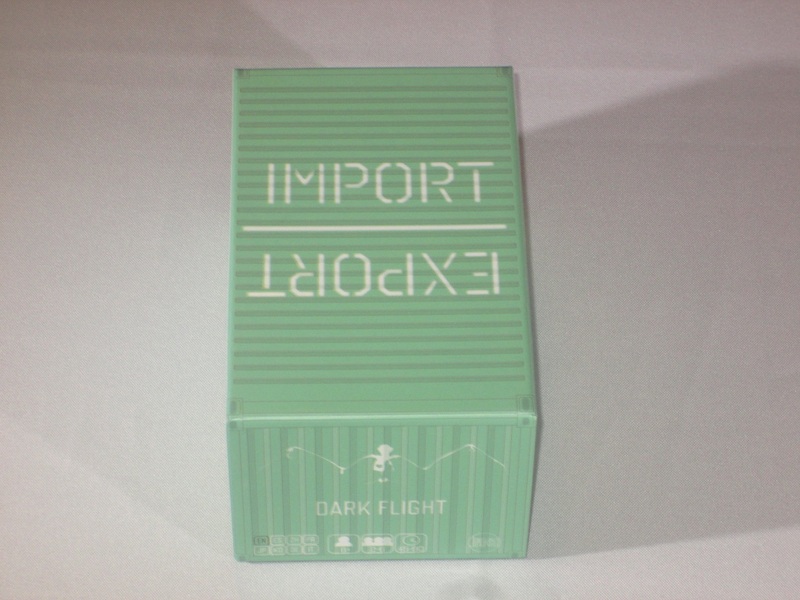 iSlaytheDragon would like to thank Dark Flight for providing us with a copy of Import/Export for review. I’ve been excited to try this one, Glory to Rome is probably my favorite as well. I’m wondering since your original GtR review was based on the Republic rules, and now you’re saying it is your favorite game, is that still the rules you are using, any thoughts on the Imperium rules? I’ve switched to using the Imperium rules almost exclusively. I like the extra bite of it. Jacks are more important, as are legionaries. Dealing with a diminished pool is important. I just love it. I recently played my fiftieth game, so I’m planning to write a Shelf Wear review for it soon.